Today went pretty well over-all…except for the fact that I woke up having lost NO weight from yesterday. I was really enjoying that Sushi in the moment, but now I resent having eaten so much of it because it made all my hard work exercising go to naught. I really need to find balance! As I mentioned on Instagram (don't follow me? you should! We have lots of fun over there!) my goal for Day 2 was to really focus on my food. I did MUCH better today than yesterday. I had a green smoothie for breakfast (treated myself to some low-fat whipped cream to make it taste even better. Totally worth the calories. ), packed healthy snacks to the pool (grapes, peaches, string cheese – all super cheap thanks to price-matching), and even avoided most of the desserts at the family pot luck we had tonight, and made my family home-made sandwiches rather than buying a $5 pizza like we normally do. We managed to do another intense workout from Insanity. It was 11pm by the time we got around to it. It was absolutely the LAST thing I wanted to do, but we did it, and I'm glad we did. Sweating like crazy, muscles shaking, and it wasn't ‘fun' per say, but it felt GOOD. When I was at the pool with my kids in the morning I made it a point to swim laps and chase them around in the pool rather than sit on the edge like I normally do. Even those little calories burned here and there really make a difference! I figure, hey, if I'm already at the pool anyway, might as well multi-task and get some exercise in. My kids absolutely LOVED that I was so active with them, too. Emotionally conflicted today. I WANTED to eat desserts tonight. I didn't WANT to exercise. I WANTED to sit and do this post and watch the Bachelor. But I know that if I can get over this initial difficult hump at the beginning, then it should be easier. The most difficult part is deciding to START…right? Let's hope! How was YOUR day2? Leave a comment and share! 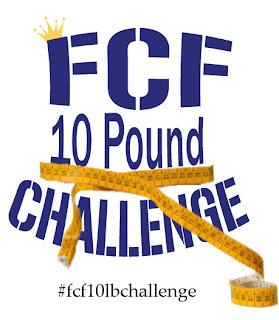 Be sure to follow along using #FCF10lbChallenge on Instagram and Twitter, and post your pics. Cowabunga Bay Day-Pass Giveaway (Utah)! Plus, EXCLUSIVE discount to FCF readers!